Mexican carriers Aeromexico and Volaris managed to turn profits during FY2013 despite the country’s sagging economic conditions that produced GDP growth of just over 1% in 2013. Mexico’s dour economic conditions resulted in each carrier facing yield weakness during 4Q2013, which triggered a quarterly loss at Volaris. No improvements in pricing traction are expected until 2H2014 at the earliest, which means in the short term Aeromexico and Volaris will continue to trade yield for load factors while preparing for double-digit capacity growth during FY2014. Given the expected slow recovery in Mexico’s domestic market, each carrier has opted to steer a larger portion of their planned capacity increases into international markets, where presumably the two airlines can price fares at levels to offset continued pricing weakness on domestic routes. Mexico’s only full service and major network carrier Aeromexico recorded a 4Q2013 net profit of MXP385 million (USD29 million), which is a 37% decline from the year-ago period. In 4Q2012 the company benefitted from the sale of a 20% stake in PLM, a subsidiary that manages Aeromexico’s loyalty programme. Absent that sale, Aermexico’s 4Q2012 profit was MXP10 million (USD749,000). The carrier’s top-line revenues in 4Q2013 grew 8.7% to MXP10.7 billion (USD801 million), while rival Volaris recorded a 1% drop in revenues during the quarter to MXP243 million (USD18 million) and recorded an MXP97 million loss (USD7.3 million) compared with a profit of MXP130 million (USD9.7 million) the year prior. Volaris CEO Enrique Beltranena recently explained to analysts unexpected market conditions including weaker Mexican and US economies and a decline in consumer confidence created soft passenger demand, “driving a very low fare environment” that Volaris could not offset with higher load factors. Growth in Mexico’s domestic market slowed to around 7% during FY2013 after nearly 10% growth in FY2012. During 4Q2013 Volaris’ fares fell nearly 17% and yields sank almost 15% as load factors fell 1.7ppt to 79%. 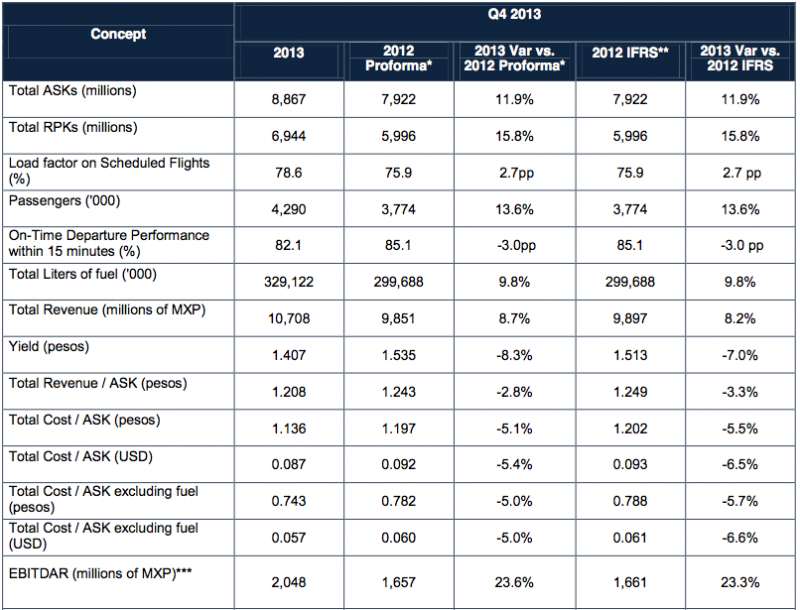 Aeromexico’s yields also fell during 4Q2013, decreasing 8% year-on-year. Some of the drop is attributable to a strategy the carrier adopted in 2013 to trade off yields to increase load factor in Mexico’s domestic market as its rivals Volaris, VivaAerobus and Interjet have quickly built up their respective shares within Mexico during the past few years. During 4Q2013 Aeromexico’s load factor increased 2.7ppt to 78.6%. Aeromexico has the benefit of a broader international network, with long-haul service to London, Paris, Shanghai and Tokyo as well as several South American destinations. On US transborder routes, it leverages codeshares with its equity partner Delta Air Lines. Those benefits provide Aeromexico some shield from weaker domestic conditions. 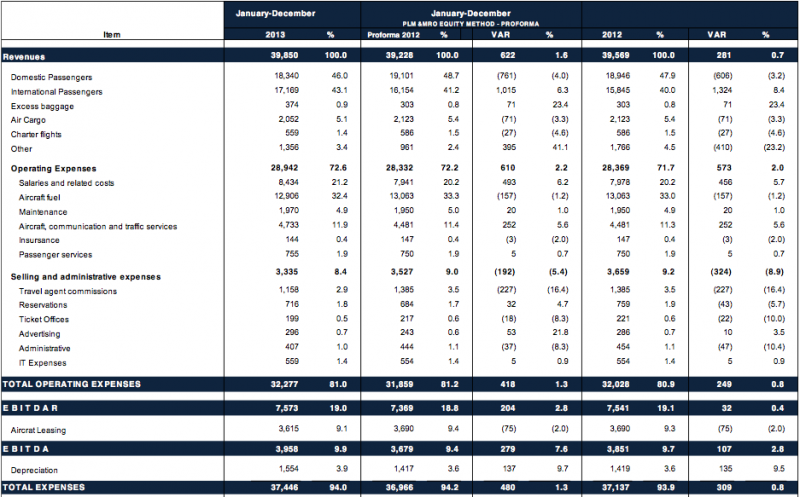 During 4Q2013 customer revenue from domestic flights represented 50.4% of Aeromexico’s total passenger revenue while international accounted for 49.6%. For FY2013 Volaris’ profits fell 30% to MXP206 million (USD15.4 million). Revenues increased 11% to MXP13 billion (USD973 million). Aeromexico’s profits increased 2.7% to MXP1 billion (USD75 million), while revenues grew 1.6% to MXP40 billion (USD3 billion). The carrier explained rise in its revenues for FY2014 was driven by improved international travel conditions and other revenues that offset a decline in its domestic passenger, cargo and charter revenues. 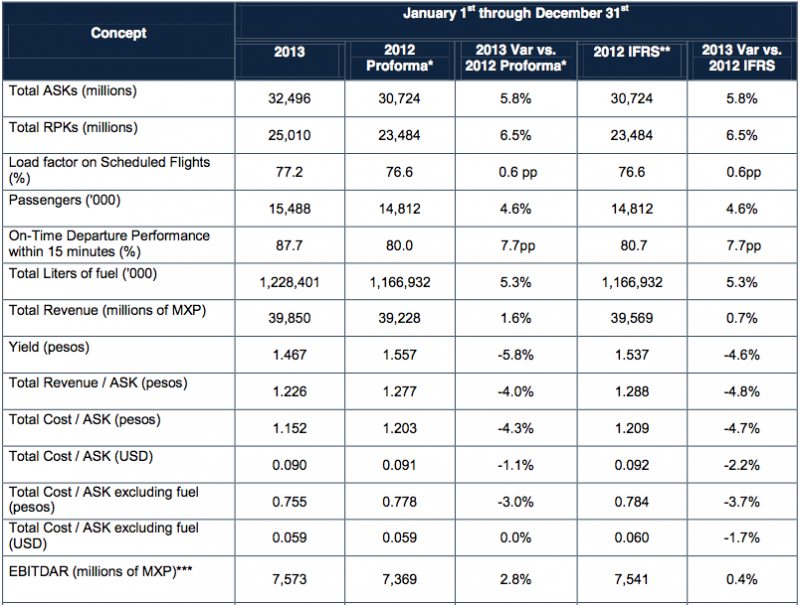 Both Aeromexico and Volaris lowered their unit cost excluding fuel in 4Q2013 and FY2013. 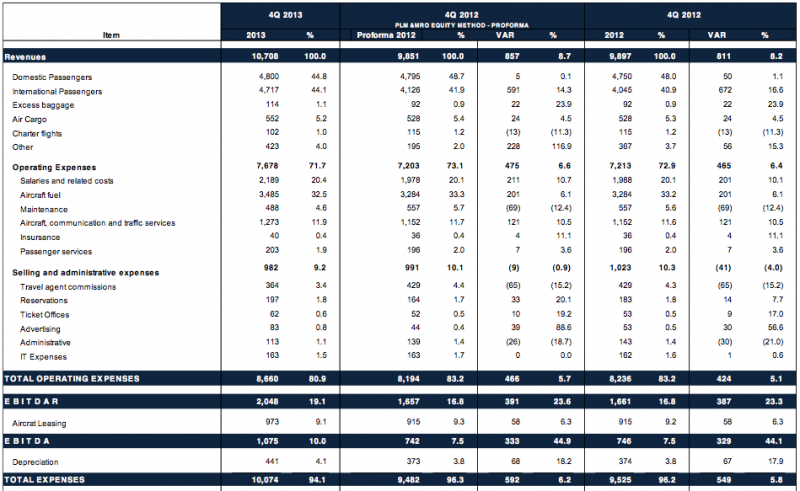 Aeromexico recorded a 5% decline in unit costs excluding fuel in 4Q2013 and a 3% decrease for FY2013. Volaris posted 7% fall in unit costs in 4Q2013 and a 2% drop for FY2013. Part of Volaris strategy in lowering unit costs is taking delivery of larger-gauge Airbus A320 narrowbodies. It estimates a 55%/45% split in its fleet, with 174-seat A320s holding the larger share. The carrier ended 2013 with 24 A320s and 20 A319s. Volaris’ smaller A319s are configured with 144-seats. To further drive down its unit costs Volaris has launched plans to retrofit its A320s with an additional five seats, which the carrier estimates would cut its unit costs by 2.7%. Cost initiatives underway at both carriers should ease some of the burden from a still-weak domestic market in Mexico, and each airline is focussed on further cost reductions as a recovery in pricing traction may not gain legs until mid-2014. Aeromexico and Volaris both plan capacity growth in FY2014. Aeromexico plans 15% to 18% growth, with 19% to 22% pegged for international markets and 9% to 12% in the Mexican domestic market. Volaris expects to expand its supply 12% to 14% in 2014 with 16% expansion pegged for international markets and 12% within Mexico. Previously, Aeromexico acknowledged that in 2013 virtually every domestic player increased capacity, but concluded that should ease in 2014. Volaris also remarked it is looking forward to easing pressure, particularly in in Tijuana and Guadalajara. In Oct-2013 Aeromexico introduced a new low-fare product named Contigo from Guadalajara on certain transborder routes and from Guadalajara to Culiacan and Tijuana. The product encompasses four Boeing 737-800s in higher density 174-seat configuration targeted to migrant customers in Mexico and the US. Volaris is the largest carrier in Guadalajara as measured by seat deployment, holding a nearly 34% share for the week of 24-Feb-2014 to 2-Mar-2014 (based on data from CAPA and OAG). Volaris’ management estimated that fares on some markets in Guadalajara and Tijuana fell by 30% or 40% in 4Q2013, and in the domestic market overall is seeing further pricing reductions in 1Q2014. However, Mr Beltranena concluded that Volaris in 1Q2014 is able to compensate for the price deterioration with higher load factors. In Jan-2014 Volaris’ domestic load factor increased 3.6ppt year-on-year to 80.7% as its domestic traffic grew 19% on 14% domestic capacity growth. The carrier estimates load factors in the low to mid 80s for FY2014. Looking out into 2Q2014 and 3Q2014, Volaris sees some rationality in the Mexican domestic in general, including Tijuana and Guadalajara. More broadly, Mr Beltranena stated that Volaris expects an economic recovery “to take effect more in the second semester of the year”. He remarked that if jet fuel prices and exchange rates remain at current levels, Volaris sees potential for margin expansion for FY2014 driven by non-ticket revenues and continued cost cost control. As the end of 4Q2013 Volaris’ economic fuel cost per gallon was USD3 and the exchange rate of the USD to MXP as of 26-Feb-2014 was 1 to 13.34. In Oct-2013 Volaris migrated to a new reservations platform powered by Navitaire that it believes will improve its ability to execute ancillary sales that now include buy-on-board food options and charges for certain carry-on luggage items. The carrier expects to post year-on-year ancillary revenue growth per passenger during 2Q2014. Aeromexico and Volaris for the moment are not turning a blind eye to the realities of the still-weak pricing in the Mexican domestic market. Unlike their competitors Interjet and VivaAerobus, Aeromexico and Volaris have the benefit of broader international operations, which gives those airlines some leverage in protecting themselves as the Mexican domestic market slowly recovers. Aeromexico is the better positioned to use its international network, a partnership with Delta and a commanding presence in Mexico City, to captialise on higher yielding international passengers to offset the slow yield recovery in Mexico’s domestic market. Volaris believes its aggressive strategy of pursuing the still high number of Mexicans travelling by bus will pay off in the long term. In the near term its strategy seems built on bolstering its non-ticket revenues to combat a soft yield environment that will continue to at least mid-2014. Both airlines stand ready to continue competing fiercely against each other and their two other major competitors. But with such a tenuous recovery expected in the domestic market, all four major carriers may need to review their expectations for 2014. VivaAerobus has already shelved plans for a USD226 million IPO due to market volatility after filing a prospectus in early 2014. At some point Aeromexico and Volaris will face great pressure to adjust their growth targets if the domestic recovery they are both depending on fails to materialise. And, as Forbes magazine recently pointed out, "Mexico’s moment will only become sustainable if both society and the economy become far more predictable and certain." There is little sign of either of those goals being achieved in the short term.